I'll be walking in the So What Fashion Show, which is part of the "What is Butch" Campaign an all stud show by F-L-Y Society and Sophisticated Lyfe Entertainment. I'm excited to be walking in another show, as some of you may remember, the last show I walked in was an SLE event. However, this show is unlike any other. We are currently on a mission to change the misconceptions of studs and androgynous women. We don't all look, act, or dress alike. The So What fashion show will be a clear illustration of this. It's going to be an exciting event, come support me, F-L-Y Society, SLE, LGBT, and androgynous women! 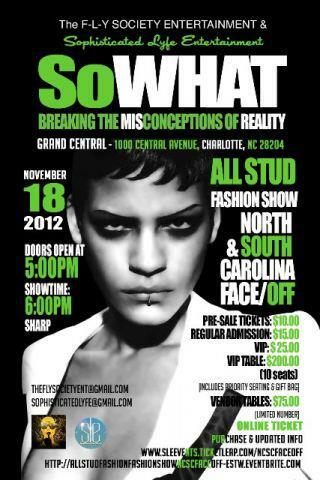 So What Fashion Show will be Sunday, November 18, 2012 at Grand Central located at 1000 Central Avenue, NC 28204. Doors open at 5! Show starts at 6 sharp so get there early!! For tickets, contact me by commenting on this post or emailing me at androgynousstyle@gmail.com.